This begs the question; was there ever a window to make a real effort for a 355-ship Navy? In a word, yes - but it is now closed and we need to be thinking about what to do instead. The window opened on election night on November 2016. When the NYT prediction needle went from 95% Clinton to 49% Clinton, I put out a private message to a small group of people I knew, to the effect, "Hey, didn't Trump run on 350 ships?!?" It took me a couple of days after the election to make even a sideways comment about the results as I was like everyone else - I did not know what to think. The next Sunday we touched on the topic with our friend Bryan McGrath on Midrats. President Elect Donald Trump, correctly understanding the current strategic environment, is committed to building a 350 ship Navy. 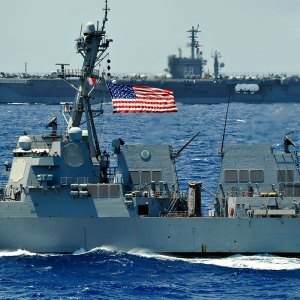 This will set aside thirty years of steady declines in the size of the Navy and put those who would make themselves the United States’ enemy on notice that the “irreplaceable nation” has picked up the mantle of leadership that it so recently cast off in an attempt to become more “normal” and less “dangerous.” However, while 350 ships may seem huge in comparison to the battle force of 272 ships we have today; it actually represents the bare minimum that is actually required to maintain presence in the 18 maritime regions where the United States has critical national interests. You can count that first week as when the window opened. Need a hard date for when it closed? That's simple; last week's SOTU. There was no mention of growing our Navy. The CINC isn't going to invest political capital in it. 355 is now outside the maritime Overton Window. Our uniformed leadership were not strong advocates either. Between Fat Leonard, 2017 in WESTPAC, and more importantly lack of D&G to make the case, they let it linger as they focused on ... well ... whatever they were focusing on. Some of those out of power with only a voice tried - from this humble blogg'r, to Bryan, Jerry, and on to radio host Hugh Hewitt. It never got traction or focus by those with hands on the levers of money and power. The final nail in the coffin was the Democrats taking the House last fall. There is no account of political capital there to draw on for a larger Navy. It just isn't there. 1. We will not have an appreciably larger Navy. We will be lucky to nudge above 300. 2. The numbers are weaker than they appear. We have three Zumwalt DDG who are of little tactical use. A large portion of our fleet will be LCS and their derivatives. We are a decade after commissioning of Hull-1 and they are still of no use. They may do come counter-narcotics work over the next year, but that's about it. Even if you allow for the most optimistic updates to both variants, they will be less capable than any other comparably sized warship designed in the last 30-yrs. 3. We are entering the Terrible-20s. Budgetary, political, and economic challenges will create an incredible counter-force to any significant growth in the shipbuilding budget as we recapitalize our SSBN force. 4. There is no serious effort to replace the Cold War era Goldwater-Nichols structure that binds our military. As such, there is little that can be done to move towards changing force structure percentages. Our comparative advantage is in the maritime and aerospace domains, yet we have a huge standing land army doing ... well ... standing land army things. You will not find money there to move to a larger Navy. 5. Our Navy has greater challenges than hull numbers. #5 is where we might have an opportunity as opposed to a problem. If we accept that we are not going to have more ships, what if instead we made efforts to make the ones we have more effective, more capable, more professional? Throw away the foolish sweet little lies spawned by the unholy union of green eye-shade efficiency cultists and arrogant Transformationalists. Throw away their despised and discredited theories, and properly man our ships with enough Sailors. Invest in refurbished shipyards, depot level maintenance, and trade a few LCS for better auxiliaries, ice breakers, command ships, and for the love of Neptune - tenders. Bring back a mindset of readiness and surge, as opposed to a "time to make the donuts" deployment cycle that makes the calendar look interesting, but burns out Sailors and their ships. In line with the above, take hammer and tongs to the shore manning documents and bureaucracy. Go sea heavy and don't apologize for it. People don't burn out on sea duty if, when at peace, you don't ... burn them out. When we run out of more money, perhaps that opens the window to be smarter. OK, fine; we aren't going to get to 355. I don't like it either, but, fine. What if instead we have every bit of a properly manned, trained and equipped half-a-Lehman, 300? UPDATE: In all fairness, over the last year or so, the Under has mentioned 355. Examples here, here, and here.